FlucT Talk The Body Politic, Internet Culture And Agency Ahead Of "Authority Figure"
The body politic will be taking on new meaning later this week with the premiere of the highly-anticipated Authority Figure, a performance piece centered on concepts of obedience and authority. And at the root of this performance is New York-based performance art duo FlucT. 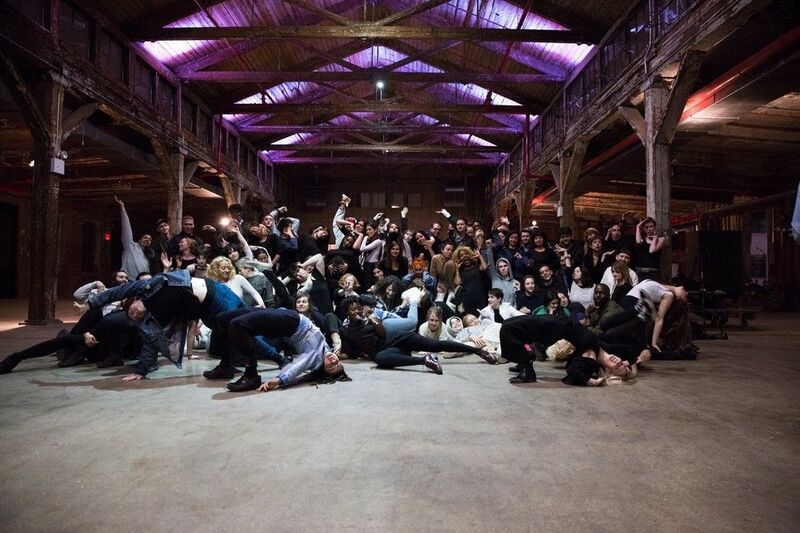 Encompassing seven choreographers, five installation artists and the Knockdown Center's 50,000 square foot facilities in Queens, it's a massive undertaking -- the overarching framework of which is provided by FlucT's Monica Mirabile along with co-director Sarah Kinlaw, who also collectively runs the creative studio Otion Front. Fellow FlucT founder Sigrid Lauren is also a key component of the project, though her involvement mostly extends to taking an active role in choreographing a section of the sprawling piece. Composed of longtime friends/collaborators Mirabile and Lauren, FlucT is a dance-oriented group working with concepts like the omnipresent "gaze" an altering the artist-audience model. It's this interpersonal and artistic dynamic spurred many of the Authority Figure's core tenets and initial ideation. And while not an "official FlucT performance," Authority Figure still embodies many of the concepts that FlucT contends with. 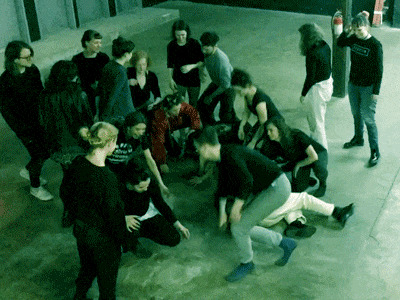 If anything, Authority Figure feels more like an ambitious expansion of many of the core ideas and principles of FlucT's independent performances, just with 100-plus collaborators and a slightly larger space this time around. A long, durational piece with several multimedia components -- including installation art, choreographed performance and music from the likes of Blood Orange's Dev Hynes and Hot Sugar's Nick Koenig -- it's meant to be an exploratory project. And to some degree, an interactive one as well. Visitors are sorted into groups of 20 based on how they answer a preliminary questionnaire, which all attendees are required to fill in. In the piece, audience members can move freely within a predetermined set of scenarios and timings that change depending on their quiz results. You could easily stay an hour, or three, depending on your preconceived attitudes towards authority. "On some level you've experienced [authority]," Mirabile explains. "Like if you've been arrested or interacted with cops in a bad way or your parents weren't nice to you. Or if you have a kid or had that one teacher who picked on you -- we're talking about the relationships that you have in your life that are always like interlaced with this power dynamic." After all, authority and obedience are familiar concepts to anyone. Recent news and political events like police brutality, protest censorship and wiretapping -- not to mention merely existing in the information-gathering Internet Age -- have both reflected and changed the way we all relate to authority. And the gradient of this relationship can be further altered by individual identities, backgrounds and past experiences. "FlucT was the original avenue for me to begin thinking about these ideas," Mirabile explains. "[The idea of authority] has come up so much; how much authority and obedience is a big part of our relationship" -- even if FlucT's relationship as a performance duo is probably better described as mutually participatory rather than "authoritative." Because as Mirabile puts it, "participation depends on your own agency" and their general performance goal is to help participants reach this realization -- and perhaps apply it to their own lives in tangible ways down the road. "We want to encourage people to have agency, to make their own decisions based on things that have happened," she explained. "We're definitely not trying to shock anyone. We're not trying to make them scared, but we are trying to get them to make decisions that are not directed by us." After all, as Lauren acknowledges, it's "not like art can change legislation," but awareness and exposure are necessary first steps in the long process toward actual change. As such, Authority Figure starts with purposeful direction of the audience on the performers' parts, but the subsequent interaction depends on how participants respond (or don't) to their provocation. Which makes sense, as spurring action and keeping things moving is also an important part of FlucT's dynamic, both literally and figuratively. And it's a core concept that's evident once our discussion takes a turn toward the sort of "sad girl" Internet culture that takes up our collective social feeds--think the poignantly self-deprecating tweets of @sosadtoday. "[The sad girl trope] makes me angry, because it's something that hits a chord," Lauren says. "I mean I understand it in terms of the way women fluctuate -- which you know that's where the FlucT title comes from, from fluctuate -- but I don't think fetishizing that kind of emotion is healthy for other people and for myself," later adding that depression is often associated with the idea of "not moving" and "not accomplishing." "It's like, let's move past it," Mirabile adds in agreement. "I don't have time to just cry anymore. Let's do something about it." Which is probably why the two are drawn to dance as a physical, active medium that is inherently political, as it's centered on an autonomous, moving body. "It begins with how you move your body, it begins with how you speak, it begins how you see yourself, it begins with the agency," she continues. "When you start being here and being responsible for yourself, then things start to change around you. It's a spiral effect and that's where like big change happens. So I feel like our performances are political because of that." It's something that's particularly important as they're both quick to point out that the mind and body are intrinsically and inextricably linked, and therefore, change begins within yourself -- as cheesy as that sounds. "[Authority Figure] is not meant to be political in the way of changing things that would really matter in regards to the economy or civil rights, but it is starting at a base which is psychological," Mirabile says. "When a lot of people have agency, are self-actualized, have responsibility [for] themselves then you start to make dramatic changes in the mind. That's what motivates and mobilizes real change. And that's why it's political." However, she's quick to point out that it's not "political art" per se. "It's like dancing with the reality of our current culture" and engaging on an intellectual level with what surrounds us using what we do have control over in any situation: Our own bodies. Authority Figure runs from May 20-22 at Queen's Knockdown Center.